Note: This page lists classic series Doctor Who audios only. New series CDs have their own separate section. Audio dramas, e.g. radio productions like The Paradise of Death or Slipback — or dramas produced exclusively for CD, like the Hornets' Nest series. 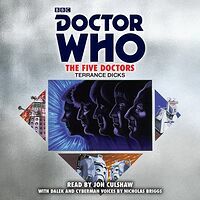 Audio readings of Doctor Who fiction — mostly taken from novelisations of the TV episodes. For example: The Doomsday Weapon. Documentaries, e.g. Doctor Who at the BBC. Audio soundtracks of TV episodes — not "soundtracks" in the musical sense, but rather actual audio recordings of the TV episodes in question, with narration added to describe the on-screen action as necessary. Initially these releases were "missing" First or Second Doctor stories which no longer existed on film or video — for example, The Daleks' Master Plan or The Faceless Ones. However, intermittently from 2006, once all missing stories had been released in this way, the BBC also started releasing "non-missing" stories from the First, Second, Third and Fourth Doctors, for example The Sea Devils. The BBC have also released several CDs of incidental music from the programme — these are listed in the music section instead. In late 2013, AudioGO (parent company of BBC Audio) filed for bankruptcy and the Doctor Who audio range went on hiatus for nearly a year before the rights were purchased by Random House and releases resumed under the new "BBC Physical Audio" banner in late 2014.